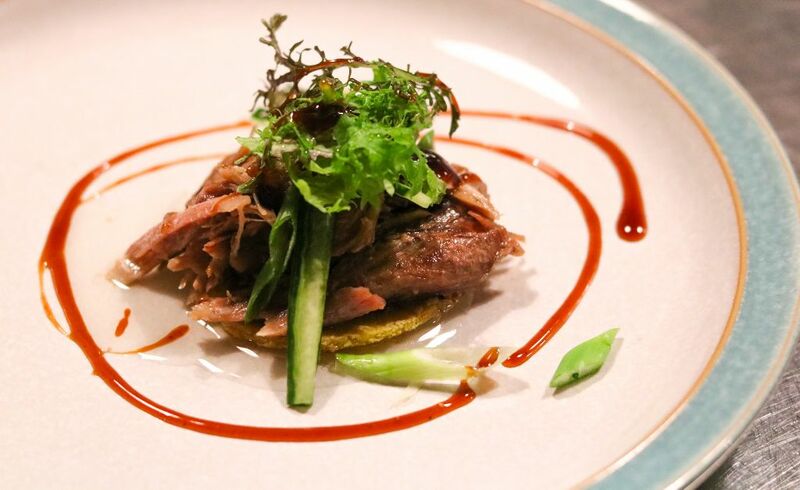 Well, the 2019 Taste Alberta Prairie on the Plate kicked off at Under the High Wheel with a flavour-packed Asian infusion on Thursday night. In advance of Lunar New Year, Chef Doreen Prei shared a four-course Asian-inspired menu featuring feature ingredients from Taste Alberta‘s commodity partners: Alberta Turkey, Alberta Chicken, Alberta Canola, Egg Farmers of Alberta, Alberta Milk, Alberta Pulse Growers Commission, and Alberta Pork. A new addition to the Under the High Wheel culinary team, chef Prei has been tasked with shaking up the dinner menu. She was eager to create a Prairie on the Plate menu to help spread the word that the brunch/lunch favourite in Old Strathcona is also open for dinner, but also because Under the High Wheel has always been a local-ingredient focused restaurant; hosting a Taste Alberta dinner was a natural fit. Our evening started with a welcome cocktail – made with ginger and basil syrup, gin, and topped with sparkling wine – followed by a welcome from Chef Prei and an explanation of our first dish of the evening. Debra, Food & Nutrition Coordinator with Alberta Pulse Growers, was on hand to explain a little bit about the organization, which represents over 6000 farmers across the province who grow pulses including chickpeas, beans, dried peas and lentils. We also learned that Canada has become a leading producer and exporter of pulses worldwide. Chef Prei explained how she used chickpea flour supplied by the Alberta Pulse Growers to create a chickpea and mung bean cake. During a recent trip to Vietnam, Chef Prei learned how to make mung bean milk, which was blended with the chickpea flour, eggs, and yogurt. Each of the little pancakes were cooked in canola oil and topped with crispy canola fried shallots and confit Four Whistle Farm turkey. Chef Prei braised the hoisin dressed turkey drums and thighs for six hours in duck fat along with lemongrass and star anise until fork tender. The dish was easily my favourite bite of the night; the appetizer was fresh tasting and full of both flavour and texture. I would certainly return to Under the High Wheel to order a plate full of them (as I am not so secretly hoping they make an appearance on the new menu in the future). Our second course of the evening was Chef Prei’s take on bún chả, a Vietnamese dish of grilled pork, noodles, and a dipping sauce traditionally served with each component separately. Darcy Fitzgerald, executive director of Alberta Pork who was also on hand for the dinner, shared that there are over 700 pork farmers across the province. Consumers need to pay extra attention when buying pork at the grocery story in order to support local farmers, as over 70 per cent of the hogs raised in Alberta are exported – mainly to Japan where the market pays premier price for Alberta pork. Chef Prei served a plated version of Bún chả – her favourite dish during her trip to Vietnam. Rice noodles, a slice of pork belly, a pork burger (flavoured with green onions and fish sauce), and dipping sauce made from pork bone broth, lime juice, sugar, fish sauce, garlic and Thai chilies all combined for a sweet and savoury flavour bomb of a second course. Conveniently for a few of us Celiacs in attendance, Chef Prei made the entire meal gluten free, which included sweet potato noodles for our main course. Chef Prei was inspired by Korean flavours; she smoked chicken thighs over kaffir lime leaves, wood chips, and shiitake mushroom stems. A sauce made of soya sauce, lemongrass, kaffir lime leaves, honey, green onions and lime juice was reduced and added to her stir fry of sauteed cabbage, shiitake mushrooms, cherry tomatoes, and lightly pickled roasted eggplants. Chef Prei enhanced the dish with Thai basil, as well as locally grown amaranth leaves. My favourite dessert is crème brûlée, so I was ecstatic that Chef Prei showcased Alberta Milk farmers and Egg Farmers of Alberta with a passion fruit crème brûlée. For me, the passion fruit and coconut milk flavoured brûlée was the perfect bite to complete Chef Prei’s Asian inspired Prairie on the Plate menu. Each of the ramekins from guests at my table appear to agree with me, as the ramekins sent back to the kitchen looked as though they had been licked clean. I couldn’t be happier that my friend Chef Doreen Prei has found a new home in the kitchen at Under the High Wheel where I can pop in for dinner more often. I’d like to thank the culinary and serving team for helping to deliver a memorable Prairie on the Plate dinner. In addition to brunch – you can visit Under the High Wheel for dinner service Wednesday to Saturday until 9 p.m., and follow Doreen on instagram for a look at her new menu and feature dishes.